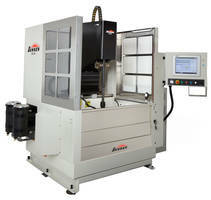 Automated CNC Honing System achieves precision parameters. Accommodating in-line, 4- and 6-cylinder engines as well as all V-6/8 blocks, Model SV-410 combines automated operation with 10 hp spindle to drive CBN and diamond tooling for precise cylinder geometry, surface finish, and crosshatch parameters. Front loading system offers 36 x 40 in. work envelope, 1,500 lb weight capacity, and 45 in. servo-controlled X-axis travel. Along with straightness sensing, features include auto-dwell, color touchscreen control, and malleable iron base. High-horsepower spindle drives two-stage metal-bond diamond tooling for short cycle times, with high accuracy and plateau finish. 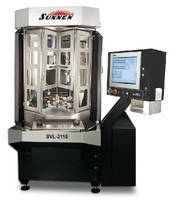 Sunnen's new SV-410 automated CNC honing system gives performance builders and production rebuilders a new level of control for achieving precise cylinder geometry, surface finish and crosshatch parameters for superior ring seal, uniform lubrication, minimal leak down and highest horsepower. Ideal for high-nickel and CGI blocks, the automated, high-horsepower honing system allows engine builders to deliver customized results quickly, with automated efficiency, for consistent quality, highest performance, and longest engine life. The flexibility of the system allows for in-line 4- and 6-cylinder engines, as well as all V-6/8 blocks. The SV-410 combines automated operation with a 7.5 kW (10 hp) spindle to drive high-accuracy CBN and diamond tooling for short cycle times and high-quality results with minimal labor. Utilizing two-stage metal-bond diamond tooling, the machine eliminates tool changes and completely finishes the bore surface with a plateaued finish. 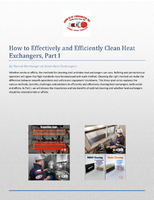 The fully automated system indexes the tool from bore to bore and (for V-blocks) the servo fixture rolls the block for access to all cylinders, ending with a rollover of the block to dump oil/coolant. The servo fixture adapts to any angle V-block via the setup screen without manual adjustments. A work envelope of 915 mm x 1015 mm (36" x 40") and weight capacity up to 680 kg (1500 lb) combine with convenient front loading for versatility in processing a wide range of in in-line or V-blocks. A 500-pound V-block can be rotated in one second, bank to bank. An optional tool-guide assembly and variety of bore-diameter gaging systems combine with a servo-controlled X-axis travel of 1143 mm (45") to allow automated honing of multi-bore blocks with high precision. Straightness sensing capability provides a display of the bore profile during the cycle. Combined with a patented, servo stroking system, it allows the SV-410 to auto-dwell in any part of the bore to correct straightness automatically in the shortest cycle time. Crosshatch is controlled and set via the control screen for every ring application. The SV-410 can be used to hone blocks with bore diameters from 19-200 mm (0.75-8.00"), depending on the tool options selected. Designed from the ground up for automated processing, the SV-410 features full-height/walk-in access doors and stainless steel enclosure preconfigured for use with automated part loading systems, while the CNC control includes a built-in automation interface. Setup is simplified with a multi-axis hand wheel for fine-tuning vertical stroke, tool feed, column position and optional cradle position. The system easily walks the operator through setup. The SV-410 is built on a malleable iron base for rigidity and vibration damping. 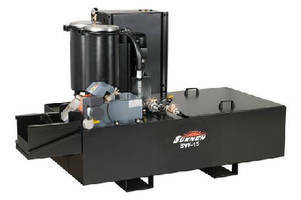 The machine's servo-controlled, straight-line stroke motion is driven by a servo ballscrew at rates of 1-160 strokes per minute, while a powerful 7.5 kW (10 hp) spindle provides ample torque for fast metal removal with tools outfitted with metal-bond CBN and diamond abrasives or standard aluminum oxide and silicon carbide stones. Oversized, lubed-for-life guide ways for horizontal and vertical axes provide smooth operation and long, maintenance-free life. An optional manual rollover fixture is available for less demanding applications. SV-410 machines can be equipped with a wide range of Sunnen tooling, including General Hone, GHSS, GHTS, PH, CV/VK, P20/P28, MPS, HB and the new PH precision multi-stone tool. The PH tool is custom-designed for specific applications and can hold as many stones as possible to produce optimum straightness and roundness. It is available in single or two-stage configurations, along with optional, integral air-gaging for in-process monitoring. The precise control of the SV-410, coupled with Sunnen tooling and abrasives tailored to the job, means a high quality bore for every engine application every time. Whether the job is rebuilding for everyday use, building 4-cylinder tuners, or creating the latest high powered V-8 crate engine, the SV-410 produces optimum cylinder geometry and surface finish. 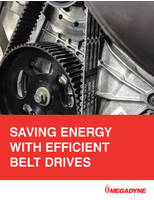 This translates to better ring seating, less blow by, reduced oil consumption, and more power. 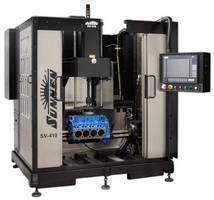 A better quality cylinder with a low cost per bore is the Sunnen solution for engine building. For additional information on the SV family of machines, contact: Sunnen Products Company, 7910 Manchester Rd., St. Louis, MO 63143. Tel: 1-800-325-3670; fax: 314-781-2268 or email sales@sunnen.com. 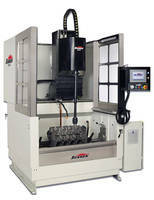 Honing Machine can finish hone a tapered bore. 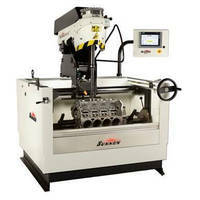 Honing Tool suits medium/high production bore sizing. Honing Machines fit on any workbench.